Paid with the country's near-worthless bank notes, these amateurs, in turn, supply the government with hard currency to purchase badly needed imports of food and hygiene products. This gold trade is a blip on international markets. 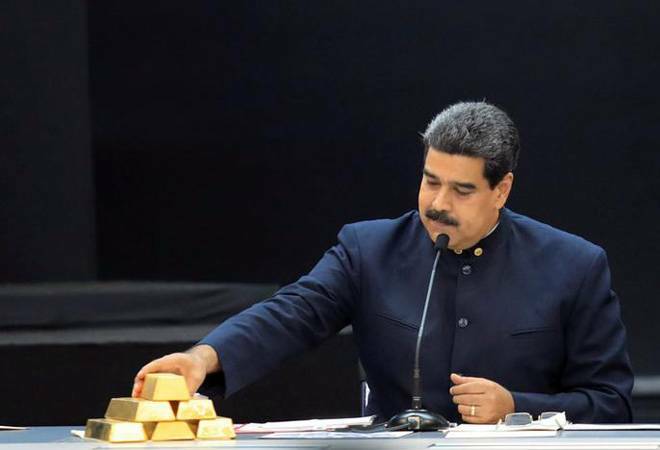 Still, the United States is using sanctions and intimidation in an effort to stop Maduro from using his nation's gold to stay afloat. The Bolivarian Revolution now leans heavily on ragtag laborers such as Jose Aular, a teenager who says he has contracted malaria five times at a wildcat mine near Venezuela's border with Brazil. Aular works 12 hours daily lugging sacks of the earth to a small mill that uses toxic mercury to extract flecks of precious metal. Mining accidents are common in these ramshackle operations, workers said. So are shootings and robberies. Miner Jose Rondon is used to hardship. Now 47, he arrived in 2016 from northeast Venezuela with his two adult sons. His bus driver's salary could not keep pace with Venezuela's hyperinflation, which the International Monetary Fund projects will hit 10 million per cent this year. The three men net roughly 10 grams of gold monthly from backbreaking work. Still, it is roughly 20 times what they could earn back home. "The state is buying gold, everyone is buying gold, because it's what is doing well," said Jhony Diaz, a licensed wholesaler in Puerto Ordaz, 171 kilometres (106 miles) north of El Callao. Diaz says he buys gold from traders and resells every three days to the central bank. Because Venezuela's currency, the bolivar, is worthless every hour someone holds it, the state pays a premium over international prices to make it worthwhile for those who could smuggle gold out of the country to exchange for dollars. Gold purchased by the government is smelted in the nearby furnaces of Minerven, the state-run mining company, according to a high-ranking employee. It is then transported to the vaults of the central bank in the capital Caracas, 843 kilometres (524 miles) away.